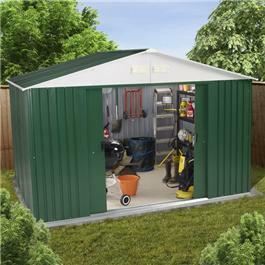 BillyOh Carrington Metal Shed 10′ x 8′. Space . 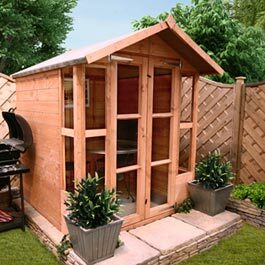 We believe that the Carrington sheds are probably the best looking metal sheds on the market. We have carefully checked Carrington s inside floor measurements with competitive makes to find that the Carrington 10 x 8 provides you with 7.6 more floor space than its main competitor. Strength . Most Important The deep roll-formed wall and roof panels provide unique strength unlike shallow formed clad sheds. Hot Dipped Galvanised Steel . This metal shed is made throughout from quality, hot-dipped-galvanised steel – unlike most, competitive models using electro-galvanised steel that cannot provide the rust protection only hot-dipped galvanised steel can provide. Additionally, all painted parts are powder coated for a lasting, maintenance-free finish . Base . Please ensure that when you build your concrete or flagstone base to insert a strong plastic membrane below the concrete or flagstones to prevent rising damp. Build your base no more than 30mm larger all round than the base measurements given below under technical information to allow rainwater discharging off your base at the sides of the Carrington. Instructions . Comprehensive, illustrated step-by-step user instructions supplied to help make assembly easier. Optional Tongue and Groove Floor Information . A Tongue and Groove floor is constructed to take a greater load capacity and provide better damp proofing ensuring protection of your contents. If the tongue and groove base option is selected, woodscrews and washers must be used we cannot supply to attach the shed to the timber floor. Woodscrews go through the shed’s inner base rail holes with the washer for each screw securing adequate purchase between wood screw base rail timber floor. What is a Steel Foundation Kit and do I need one . It is a quick and easy way to create a suitable base for your metal shed after you have levelled your site and inserted a DPC Damp Proof Course below the foundation kit. It is manufactured using heavy-duty U channel framing, made from durable hot-dipped galvanized steel. The assembled foundation kit receives the shed base rails and flood out with concrete after the shed assembly is completed to give the perfect base. Please Note The product or model name may differ on the packaging from that advertised however this does not affect the intrinsic product . Manufactured by BillyOh.com.